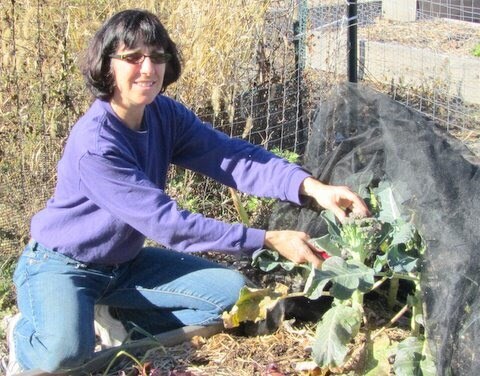 Did tutu fabric protect Howard County Master Gardener Susan Levi-Goerlich’s broccoli from cabbage butterflies this summer? I checked with Susan last week at her plot at Westside Gardens, a part of Columbia Gardeners, Inc., to get a progress report. The tutu worked to keep the butterflies from getting to the broccoli leaves to lay their eggs but didn’t solve a new problem—harlequin bugs. Susan’s thought of one possible way of thwarting the stink bugs. Briefly blanch or steam 1 head broccoli, cut into flowerets, until bright green. Cook 1 pound ziti or penne until al dente. Toss together pasta and veggies. Top with ¼ cup grated Parmesan. Serve hot or at room temperature. Serves 4. Adapted from The Dinah Shore Cookbook. If you want to read my August 7 blog about how Susan uses tutu fabric, CLICK HERE. I used regular floating row cover over broccoli rather than tulle, but I had the same problem with the harlequin bugs. They just sat there and sucked. Next year I plan to hold the row cover well off the plants with wire hoops. Good idea with the wire hoops! That would definitely help. It's all Jon Traunfeld's idea! He says 9-gauge wire.